Coming to Atlanta on September 19-21, 2013 : “Rested, Refreshed, Restored: You & Your Garden”, is a unique health and longevity garden design workshop. You CAN create a garden oasis that delivers genuine benefits to improve your well-being. Discover the secret components of a landscape design that you love and relieve your stress instead of adding to it. The Atlanta History Center is host site for the third 2013 Landscape Your Life 3-day garden design workshop intensive. Study gardens in Buckhead to see what makes them “tick”, plug into innovative workshops designed to breakthrough your garden “blockages”, peruse the Cherokee Garden Library’s southern garden history and horticultural books collections, plus discover a structured process to program your landscape to be the best it can with therapeutic lifelong landscape principles. 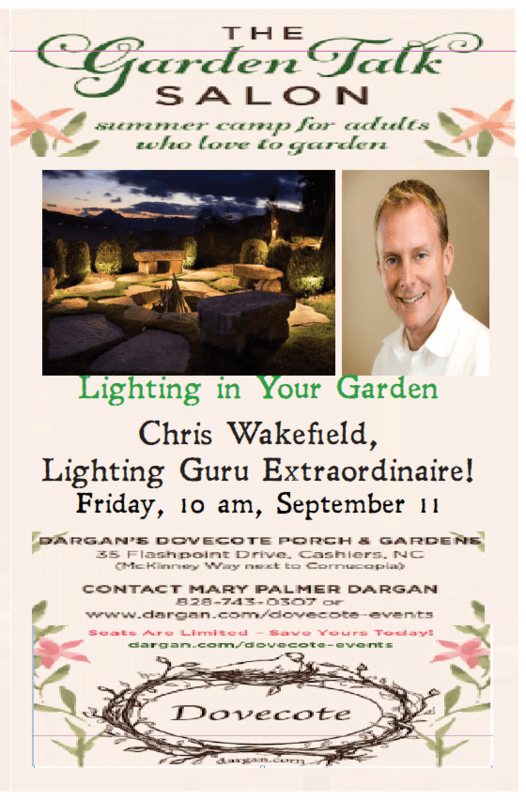 Expand your knowledge with guest speakers : plant hunter Ozzie Johnson, environmental horticulturist Matt Richards, garden historian Staci Catron and lighting guru Chris Wakefield. Enjoy new friends at our PlaceMakers Gala, gourmet luncheons and farm-to-table private dining at Seasons 52. “Rested, Refreshed, Restored: You & Your Garden” completes three unique landscape design intensives, Charleston Spring: Courtyard Gardens, Cashiers Summer Sizzle: Garden Design, and now, Atlanta Fall: Gardens for Health & Longevity, which celebrate Dargan Landscape Architects’ 40th anniversary. Whether you are an elder downsizing, a young balcony gardener or a growing family, homeowners at any stage of life benefit from lifelong landscape design techniques. Come take your garden to school with award-winning landscape architects and founders of The American Certificate of Landscape Design, Hugh and Mary Palmer Dargan, aslas.